What is tire cupping and what causes it? Tire cupping, also sometimes known as tire scalloping, is a particularly destructive form of tire wear. Cupped tires can be uniquely identified by their distinct high and low spots. 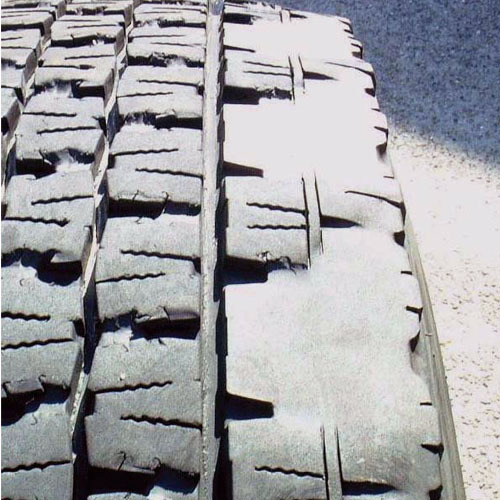 Whereas other types of premature tire wear occur consistently around the tire (like through the center of the tread, or on the edge), tire cupping is characterized by an inconsistent high-low “cup-like” wear pattern. As you can see, the cupped tire has distinct high and low points in the area of accelerated treadwear. Can a cupped tire be fixed? If caught early enough, many types of premature tire wear can be corrected with inflation adjustment, (re)alignment, rotation, even a combination of dismounting, flipping, and rotating the tires when circumstances permit. The same is true of minimally cupped tires. However, if a cupping pattern becomes clear enough to see visually with obvious high and low points, and with deficient tread in the low points, then that’s pretty much a wrap on that tire. The extent to which the tire tread has been carved out at its low points determines whether recovery is possible. In advanced cases of tire cupping, there is no available “correction.” So it’s crucial to recognize a cup wear pattern early on, and understand the causes of tire cupping so you can avoid it altogether. What causes tires to cup? Wheel imbalance. Steering wheel feedback/judder, and rhythmic feedback through the seat on smooth roads: these are signs of an out of balance wheel or wheels. If the feedback is strong enough to be felt at points inside of the vehicle, then the impact/stress on the tire is significant. Sustain that same impact pattern over the long-term and millions of tire rotations, and it’s easy to imagine how the tire tread eventually reflects the imbalanced rotation. Typically, if you can feel the vibration in the steering wheel the problem is most likely the front tires that need balancing. If you feel a vibration in the seat, it’s the rear tires. Feel it in both, you should have all tires rebalanced. If rebalancing doesn’t fix the problem, you should have the suspension and alignment check. It’s also possible to have a tire that’s out of round or a separated belt causing the vibration. Keep in mind vibration may not be felt consistently. You might feel it at one speed, but sense it disappear at another. Fortunately, the correction for an out of balance tire or wheel is straightforward and economical. 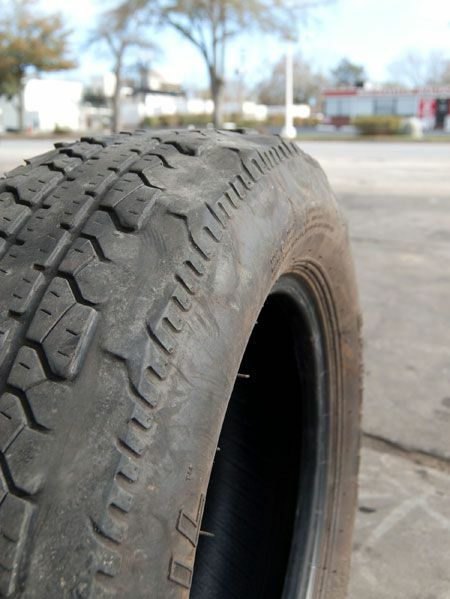 Tire balancing is a staple service of any tire shop, and balancing alone typically costs $7-$15 per tire. However, you can always look for a shop with state-of-the-art Hunter Road Force Touch calibration for optimal results. It’s a little more expensive but it takes tire balancing to a whole new level. Getting the situation diagnosed and resolved at the first signs of a wheel imbalance will potentially save you hundreds of dollars in tire replacement costs over the long-term. Vehicle misalignment. If a vehicle is sufficiently out of alignment, this can result in inconsistent friction levels and focused wear points at the front and/or back wheels. As in the case of an out of balance wheel, with a long-term pattern “scoops” of accelerated tire wear will begin to show. Read more about the importance of vehicle alignment. Suspension issues. 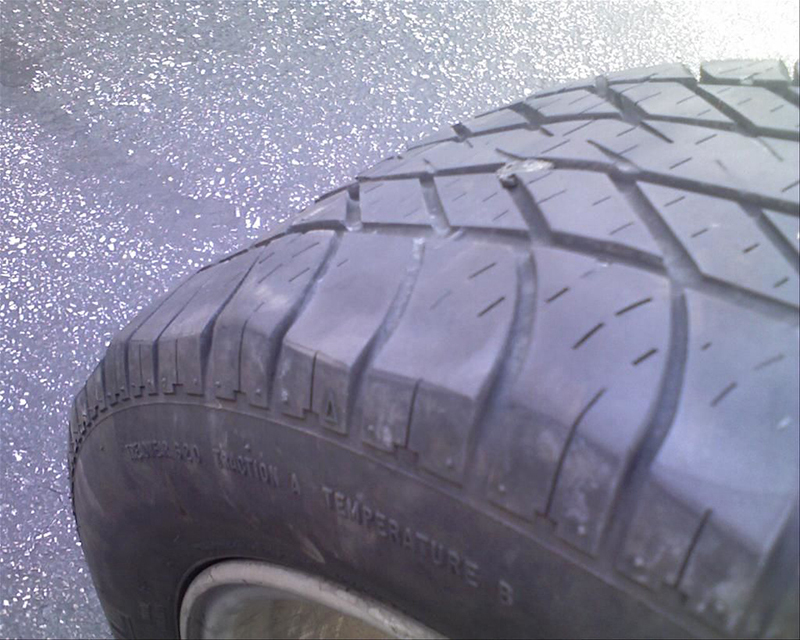 The most extreme and visually distinct cases of tire cupping are typically caused by damaged or worn suspension. Tire cupping as a consequence of wheel imbalance or misalignment is a sort of “death by a thousand cuts” scenario. Tire cupping from suspension malfunction can be much more immediately catastrophic. When suspension components are not functioning as intended – particularly on the absorption (compression) side of the equation – that transfers the brunt of road impact to the tires. Tire cupping results from the tread blocks routinely absorbing all of those road imperfections. Unfortunately, diagnosing and observing suspension issues is often not as straightforward as an imbalanced wheel. Especially because suspension component degradation can occur over many years, drivers might not notice the difference. During routine tire rotation and servicing, verify that your tires are inspected for abnormal wear patterns like early signs of cupping. And particularly if your vehicle is older, make suspension inspection an annual service. At around $20 at many shops, it’s a proactive service/maintenance item that can lead to significant savings over the long-term. What are the symptoms, and how can I diagnose cupped tires? Behind the wheel, the symptoms of a cupped tire can be nearly identical to the symptoms of an out of balance wheel: Steering wheel judder and chassis feedback felt through the seat. Cupped tires also tend to create excessive road noise that becomes increasingly pronounced as speeds increase. Even before being visually apparent, tire cupping can sometimes be felt. With your vehicle parked and secured, run your hand around the tire tread. Feel any high and low points to the tread pattern? Tire tread should wear uniformly across the contact patch and around the circumference of the tire. Before significant high-low points become observable, tire cupping starts with smaller variations around the tread blocks. Examine the tire in a longitudinal fashion, i.e. as the tire rotates. Are there variations from one tread block to the next? Certain tread grooves or siping appear to be more worn down than at other points in the same line of tread blocks? These could be early signs of tire cupping. Tires are engineered to provide sufficient traction with uniform tread contact with the road. The “contact patch” of the tire needs to stay consistent as the tire rotates. The high and low points of a cupped tire prohibit this consistent road surface interaction. The consequence is compromised all-around traction and vehicle performance. If any of your tires have reached an unrecoverable stage of cupping, don't press your luck. Be sure to get a diagnosis from a tire professional. TireBuyer is partnered with over 9,000 installers nationwide who can get you back on the road again. Have questions, or need help finding a new tire? Shop for tires today or give us a call at 866-961-8668.